London: Roman Londinium Map Created by Britannica Online for Kids. 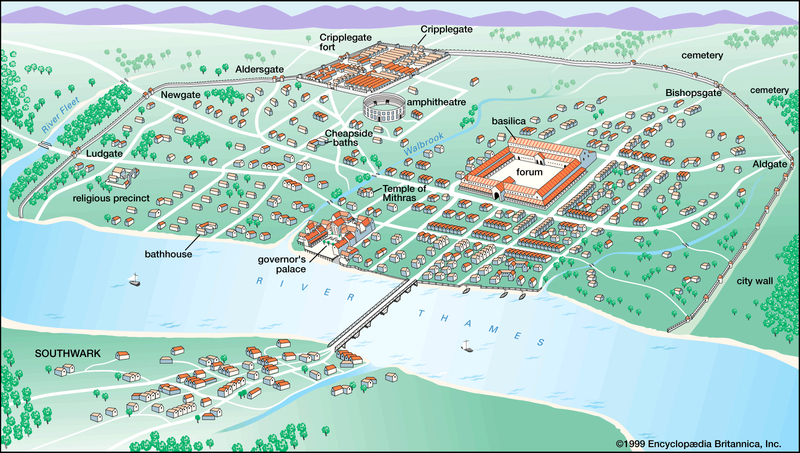 The map above shows what the Roman City of Londinium (modern day London) might have looked like around 200 AD. Londinium was founded around 43 AD and was located in what today is the City of London. The map above shows the London wall around Londinium, which is believed to have been completed sometime between 190 and 225AD. At its peak in the year 140 AD, Londinium may have a population as large as 60,000 people. So was likely more densely populated than what the map shows above. Nevertheless, it gives you an idea of where the major sites of Roman London would have been located. the only reason i searched this up was for my childs homework!